Summary: Canberra is a great place to go walking with lots of well-maintained pathways and nice open spaces with good views. 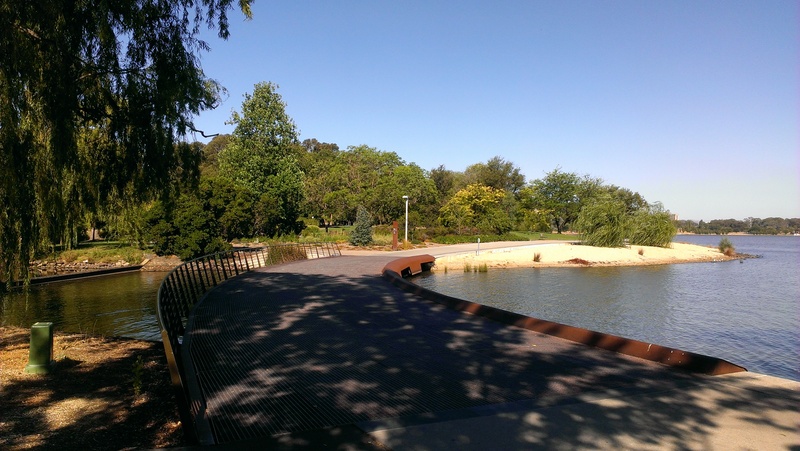 This walk is a perfect way to see many of the sights of Canberra and is ideal for wheels. This walk starts at the public car park for Commonwealth park accessed from Albert street and Birannie drive. This is near Commonwealth avenue bridge, which connects South Canberra with Capital Hill. Go down to the path hugging the lake and walk to the left underneath the bridge. There is a pathway all around the lake which is a total of 28km, however it can be divided into three loops and this walk is the middle or “central” loop. Initially the path takes you past Commonwealth park and Nerang pool, an aquarium pond full of birdlife and surrounded by lovely flowers and shady trees. Continue on and you’ll walk past a statue of R G Menzies, the longest serving prime minister of Australia with 18 years in total over two periods. 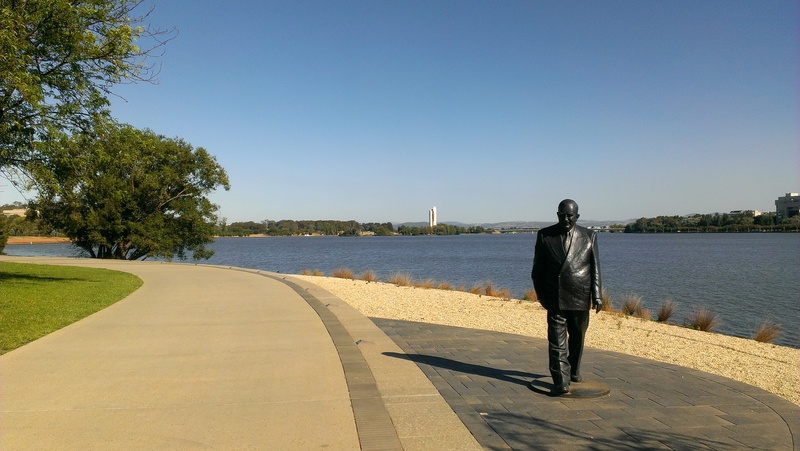 The stretch of path between Commonwealth Avenue bridge and Kings Avenue bridge is also called the RG Menzies walk and recognizes his role in establishing and developing Canberra as “ a worthy capital of Australia”. Just before you reach the bridge by Kings Avenue there’s a monument honouring the merchant navy on your left and then you’ll see a small island on your right. This is Aspen Island and it is worth a detour. Walk across the footbridge, named after John Gordon who was appointed the first Canberra carillonist. 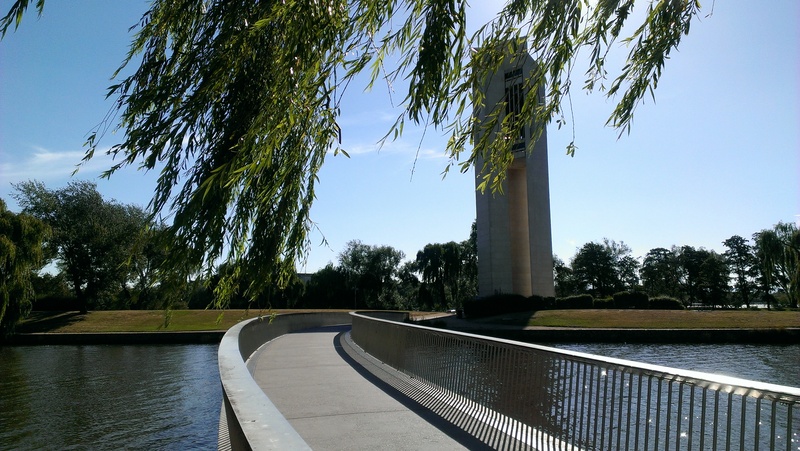 The bell tower on the island was a gift to the people of Australia from the Government of the United Kingdom to celebrate 50 years of Federal Government in Canberra and was presented by Queen Elizabeth in 1970. With its 55 bells is it still in use and it is a lovely setting. Shortly thereafter you need to get up to the Kings Avenue bridge and walk across. On the other side you’ll see a path leading off the bridge to your right and then walk towards the lake again. 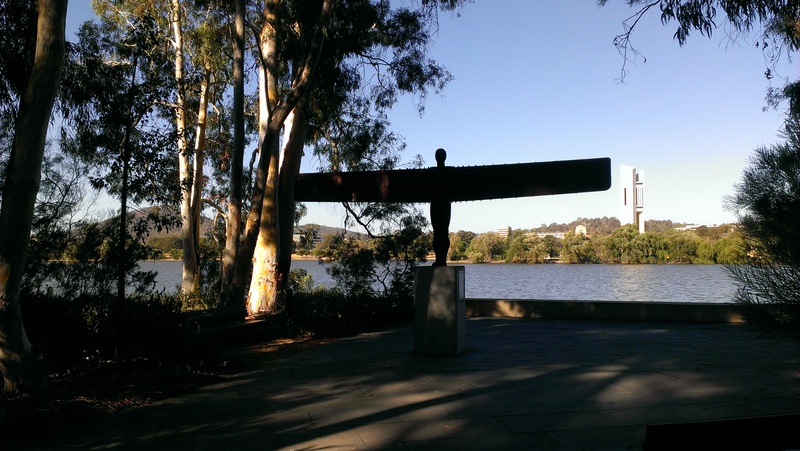 You’ll walk along the back of the National Art Gallery with its sculpture garden, including the Angel of the North statue. This is a small replica of the giant original placed on a hillside outside Gateshead in Northern England, and this life-sized model was given to the museum by the British Government. Continue along the lake past various government buildings, including the High Court of Australia. When you get to the Commonwealth Avenue bridge, follow the path onto the bridge, cross over to the other side and you’re back where you started.